ELASTIGIRL is called up to save the day and campaign for her fellow superheroes in Incredibles 2. The follow-up to Pixar's 2004 Oscar-winning animated film shakes up the dynamics of the super-powered Parr family as Bob, aka Mr Incredible, stays home to care for the children while his wife Helen, aka Elastigirl, becomes the face of the campaign to make superheroes legal again. Star Holly Hunter says it's a happy coincidence that working mum Elastigirl is in the spotlight this time around considering the recent discussions around gender equality and the #metoo movement. "It's really serendipitous that the movie happens to be coming out at this particular moment," she says. "I don't think that was a message Brad (Bird, the writer/director) wanted to convey. I think Brad is a feminist. He was talking about revealing completely different aspects of every single character in the movie. Violet is going through adolescence ragging around the house, Mr Incredible is realising he could be a really fantastic dad, Mrs Incredible is out being a hero and Jack Jack is being 27 different babies at once. The movie is about all of the different people we have inside of us, what our life demands of us and how many of those demands we actually rise to meet." It has been 14 years since The Incredibles last put on their masks to battle the bad guys, but in the long-awaited sequel it will feel as if no time has passed at all. 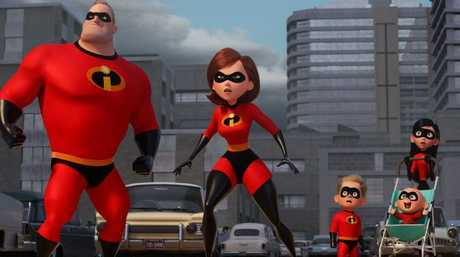 Incredibles 2 picks up with the Parr family just after the events of the first film, as the villain the Underminer continues to wreak havoc on Metroville. "What an absolute cliffhanger to leave the first movie on," Hunter says. "Brad felt there was such a wealth of drama that he had access to, to begin the second movie right there 14 seconds later but 14 years later. 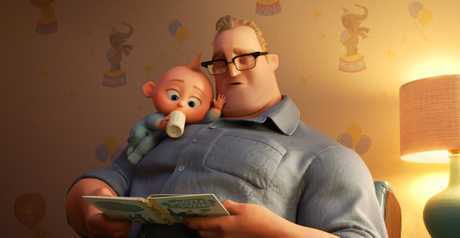 That's something only an animated movie can do." The Oscar-winner had no qualms about returning to the role after so many years, during which she has become a mum to twin boys. "Brad had directed Mission: Impossible - Ghost Protocol and Tomorrowland, so I knew Brad was really involved in other things and it wasn't like I was hanging around putting my life on hold for Incredibles 2. I was pleasantly surprised when it happened," she says. "The predominant, abiding attraction to the original Incredibles story is that people love seeing all these manifestations of family. It's universal and never-ending the variety a family offers us. Brad felt that he had this endless fountain of ideas that could come from the family and I was very attracted to that as well." Hunter reveals Bird, who also voices pint-sized superhero suit designer Edna 'E' Mode in the films, was with her in the recording studio for every session. "It was a total partnership with Brad. He was in the room with me all the time," she says. "I didn't do a single solitary recording session over the two movies without Brad. He would fly to where ever I was, or I would fly to wherever he was. "I was never alone.... I have felt that with other things that I've done but not with The Incredibles."